A thrust bearing is a particular type of rotary bearing. Like other bearings they permit rotation between parts, but they are designed to support a predominantly axial load. Thrust bearings come in several varieties. Thrust ball bearings, composed of bearing balls supported in a ring, can be used in low thrust applications where there is little axial load. Tapered roller thrust bearings consist of small tapered rollers arranged so that their axes all converge at a point on the axis of the bearing. The length of the roller and the diameter of the wide and the narrow ends and the angle of rollers need to be carefully calculated to provide the correct taper so that each end of the roller rolls smoothly on the bearing face without skidding. These are the type most commonly used in automotive applications (to support the wheels of a motor car for example), where they are used in pairs to accommodate axial thrust in either direction, as well as radial loads. They can support greater thrust loads than the ball type due to the larger contact area, but are more expensive to manufacture. Spherical roller thrust bearings use asymmetrical rollers of spherical shape, rolling inside a house washer with a raceway with spherical inner shape. They can accommodate combined radial and axial loads and also accommodate misalignment of the shafts. They are often used together with radial spherical roller bearings. Spherical roller thrust bearings offer the highest load rating density of all thrust bearings. Fluid bearings, where the axial thrust is supported on a thin layer of pressurized liquid—these give low drag. Thrust bearings are commonly used in automotive, marine, and aerospace applications. They are also used in the main and tail rotor blade grips of RC (radio controlled) helicopters. Thrust bearings are used in cars because the forward gears in modern car gearboxes use helical gears which, while aiding in smoothness and noise reduction, cause axial forces that need to be dealt with. Thrust bearings are also used with radio antenna masts to reduce the load on an antenna rotator. One specific thrust bearing in an automobile is the clutch "throw out" bearing, sometimes called the clutch release bearing. Fluid-film thrust bearings were invented by Albert Kingsbury, who discovered the principle in the course of bearing and lubrication investigations commencing in 1888 while a student. His first experimental bearing was tested in 1904. He filed for a patent in 1907, and it was granted in 1910. The first Kingsbury bearing in hydroelectric service, one of its major applications, was installed at the Holtwood Generating Station in 1912. It remains in full use today. Thrust bearings were independently invented by Australian engineer George Michell (pronounced Mitchell) who patented his invention in 1905. 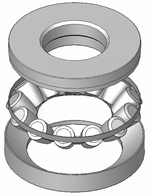 Fluid thrust bearings contain a number of sector-shaped pads, arranged in a circle around the shaft, and which are free to pivot. These create wedge-shaped regions of oil inside the bearing between the pads and a rotating disk, which support the applied thrust and eliminate metal-on-metal contact. ^ "Why SKF Spherical roller thrust bearings". SKF. Retrieved 17 December 2013. This page was last edited on 20 August 2018, at 21:05 (UTC).